One of the perfect trees. Tall, evergreen, lovely foliage, cool cones. Cedrus deodora is an exceptional conifer. I lived with this tree for a short time, until I moved. Before I knew its name I noticed it. I admired the fine whorls of evergreen foliage and the drooping branches that gave it a soft friendly quality. Like they were reaching out to shake your hand and pull you closer. This tree did pull me closer, I always enjoyed standing next to it and being under it. I liked the way the upright cones flaked apart, their papery layers drifting to the ground. I watched the needles drop and make a thick mulch under the branches. It was in a dry hot afternoon spot, but never needed irrigation from me during our dry Pacific Northwest Summers. The roots took care of all that. During a powerful storm in 2006 named the Hanukkah Eve Windstorm, my Deodar Cedar lost a major limb, along with hundreds of other trees. The tree pictured below is in my current neighborhood. As soon as I saw it I had to walk right over and say hello, or rather take pictures of it’s beautiful branches. I was interested to read that this tree is native to the Western Himalayas and is the national tree of Pakistan. The name deodar comes from the Sanskrit devadaru which means ‘wood of the gods’. The inner wood is aromatic and this tree has anti-fungal and insect repellent properties. Deodar Cedar is an important timber tree in India and widely planted as an ornamental tree in Europe. 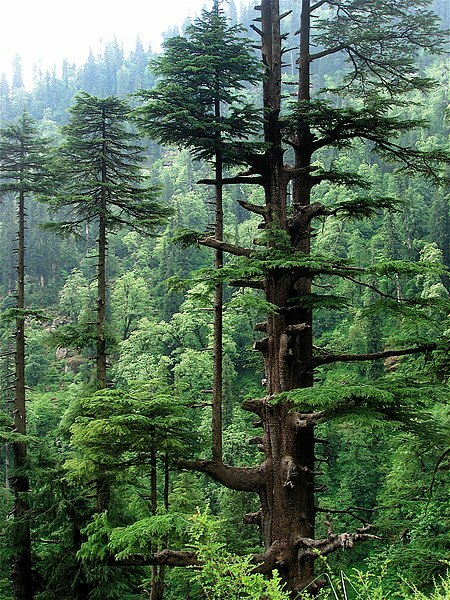 I love this photo of this cedar in it’s native habitat of India, looking quite aged and wise, where it can grow up to 60 m tall, almost 200 feet! Dirr describes it as very poplular in landscape use for it’s fast growth, fluffy and dense in youth and open and artistic with age. 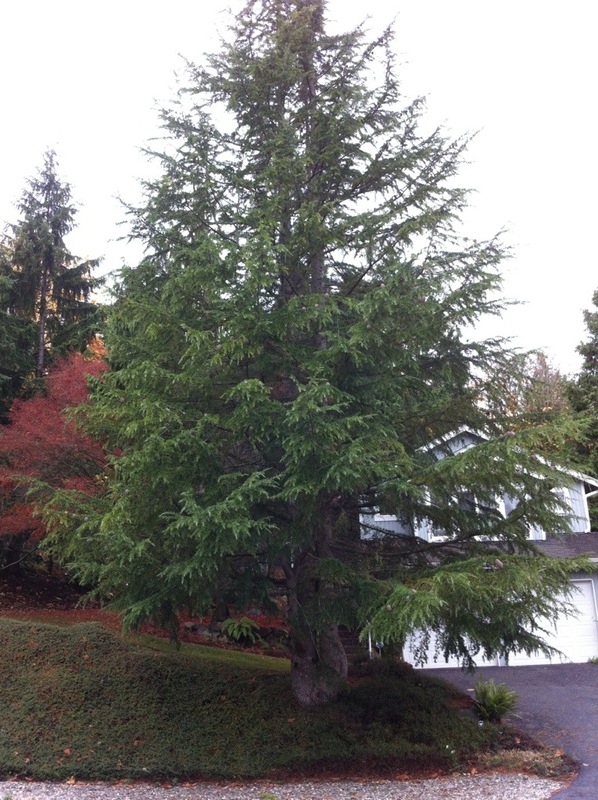 The needles are 1-2 inches in length, the longest of the true cedars. A top decline often results in multiple leader formation, which is evidenced in the photo below. He calls it an extemely adaptable tree. There are numerous varieties with colors ranging from yellow, white, gray, blue and green and from compact, to weepers to large trees. See the Monrovia website to view a few. Gorgeous! I can see why you love them so! Many, many dwarf cultivars if the straight species is too big for your garden! Do you have a favorite variety? Snow sprite is cute! Elaine, this is a very interesting post for me, as we think one of our trees is a Himalayan Cedar. When you described how the cones flake I immediately thought of ours. The seeds are very aromatic and crunch when you walk on them, and are often sticky with resin too. It’s one of my favourites for the Advent decorations! Deodar Cedars are beautiful, that one in your neighborhood is very old. We have alot of them here in the upstate mountains of South Carolina. I planted two of them the end of last year that I got for a deal. They are really fast growers too. I browsed around your site, nice pictures and good information.